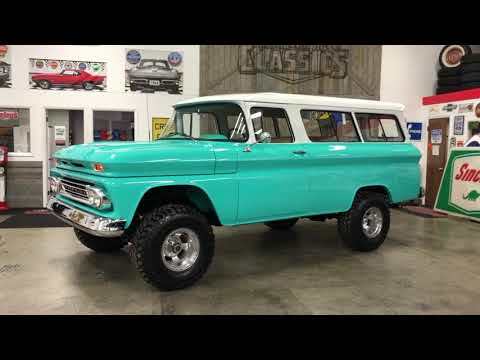 We are excited to offer this freshly restored 1961 Chevrolet Suburban 4WD. Delivered new in New Mexico and lived the last portion of its life in Texas, leaving this 61 Burb with all of its original sheet metal (excluding the hood). The restoration was extensive and was done from the frame up. The underside of the body still remains virtually untouched and original. The frame was stripped to bare metal and has ZERO pitting as you can see from the photos. This truly is a gem of a find. There cannot be many real 61 Suburbans remaining in this condition. Some upgrades were done such as a healthy 427ci Big Block V8, TH400 Automatic Trans that pushes power through the original T-Case, Slight Lift with new 33" Tires, Braided Stainless Brake Lines, All New Shocks, Upgraded Heavy Duty Steering Stabilizer, Large Aluminium Radiator, Electric Cooling Fans, Aux Trans Cooler, Billet Serpentine Belt Pulley System, Tilt Steering Column, Dakota Digital Gauges, Touch Screen Radio & Upgraded Speakers, Soft Grip Steering Wheel and probably more that we are forgetting.